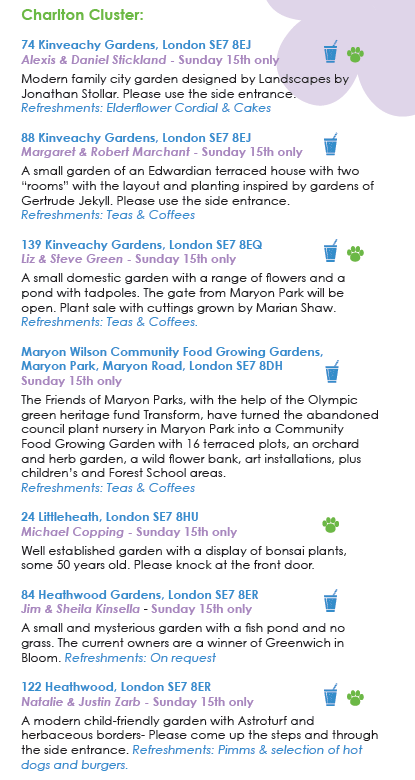 Previous Article Developments at Maryon Wilson Animal Park? Entry to the gardens is by ticket–available at the first house you visit. If you want to go just to one garden, the ticket will cost £3. A £10 ticket will gain you entry to all the gardens over the two days. We are asking for donations for the refreshments–which hosts are kindly providing. The West Greenwich and the Eltham clusters are open both Saturday and Sunday afternoons, from 2 – 5. On Sunday 15 June you will have access to the Charlton Cluster and the Cator Estate, Blackheath.